It is said that when Halloween comes around, spirits start appearing in the highly-populated [four major cities] and [Palm Base]. It so happens that [Goldiegho] and [Jack-O’] are appearing in the [four major cities] and [Palm Base] during this time. 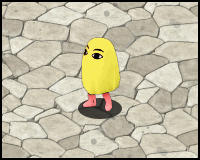 [Jack-O’] will appear in the day (06:00–18:00), while [Goldiegho] will appear at night (18:00–06:00). They mean no harm, but will turn into prankster spirits if they remain around too long. The only solution is to give them [Peculiar Treats] which will curb their impulse for pranking. Due to the influx of Halloween magic during this period of time, all Angels will receive double EXP, Skill EXP, Pet EXP! Collection Speed and Manufacturing Speed will also be doubled during this time. Make good use of the bonus! I. 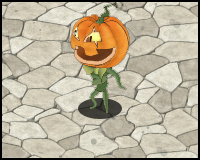 During the Halloween event, the event NPC [Halloween Pot] will be available in the Angel Lyceum to provide event information and participation services. II. During the Halloween event, players can use the [Halloween Pot] to make [Peculiar Treats] with three ingredients: [Bitter Sugar], [Spicy Cacao], and [Pumpkins]. III. Excess [Bitter Sugar] can be traded for [Spicy Cacao] at the [Halloween Pot] at a 2:1 ratio, and vice versa. IV. 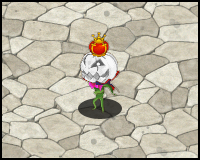 During the Halloween event, defeat monsters above Lv 21 in normal maps to get [Bitter Sugar]. V. During the Halloween event, collect resources above Lv 21 in normal maps to get [Spicy Cacao]. VI. During the Halloween event, get [Pumpkins] from [Online Rewards (7)] or by being in the top 30 at the [Angel Elementary]. ※Online Reward (7) refers to the 7th Online Reward. VII. 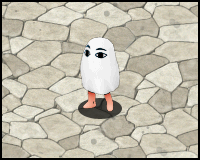 During the Halloween event, semi-transparent [Spirits] will appear in the [four major cities] and at [Palm Base]. 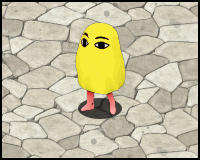 [Jack-O’] will appear in the day and [Goldiegho] will appear at night. VIII. Give [Peculiar Treats] to [Jack-O’] and [Goldiegho] to receive [Jack-O' Gifts] and [Goldiegho Gifts] respectively. Use the gifts for a chance to obtain event-limited items. IX. You will get a [Halloween Wrapper] for each gift you open. Collect these wrappers to unlock achievements. Some items obtained from gifts can also grant achievements. X. To keep the environment green, it is better not to discard [Halloween Wrappers]. Instead, gather and place them in the [Halloween Pot] to obtain event-limited items. Rumor has it that he was once a prince who turned into a pumpkin after being cursed by a witch. Right click to use and transform into a Goldiegho, increasing Movement Speed by 20%, Max HP by 6000 and Max MP by 4800. Effect vanishes when you cast a spell (a permanent item). Right click to use and transform into a Jack-O', increasing Movement Speed by 20%, Max HP by 6000 and Max MP by 4800. Effect vanishes when you cast a spell (a permanent item). It's so bitter! Who'd like the taste of this?! It's spicy! Is this some kind of joke? Is this a treat or is it a trick? Useless paper used by spirits to wrap their gifts. For the environment, it's better not the throw it away. Perhaps you could drop this in the [Halloween Pot]...? Essence of Halloween magic. It is best not to ask how it formed... Consuming this may have special effects! ※These are just for reference. The images displayed in the game will be final.